We have already covered lot of resources to download printable 2009 calendar templates of different style, color and shape. Here are few more with cool designer looks for Microsoft Office users. 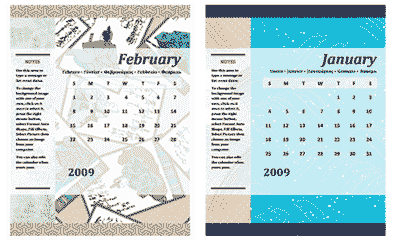 You can download Calendar 2009 designer templates for free. There are number of options in terms of design, color and looks. Some template are very good looking andÂ perfect for your desk calendar. Just download, customize (optional) and print them. Click here to access Calendar 2009 templates for Microsoft Office. There are loads of cool looking templates on offer, download, print & flaunt.